Bunk beds with trundles are making a huge comeback and not just because kids love them. 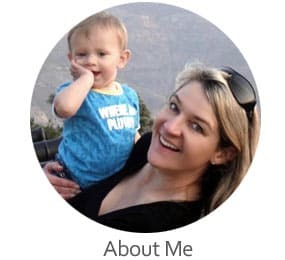 They’re great space savers, and if you have more than one child or the occasional house guest, they make sleeping arrangements super simple. Accommodating a miniature house guest becomes so much easier, especially with the trundle used as a spare bed or to store extra blankets and pillows. Bedtime is a breeze, but so is play time. Let imaginations run wild as the bed turns into a for that keeps them entertained… and localizes the cleanup area. Bedtime just became a whole lot more fun. We just love this classic design for its sturdy wooden build. Compact, yet spacious, the full sized lower level is perfect for when grandparents come to visit and the neat upper twin area has an interchangeable ladder and a guard rail for added safety. The smaller upper sleep area creates headroom below, making sitting and getting into the lower level effortless. The truckle rolls out on easy to maneuver wheels and can be used as a bed or as one large storage area for blankets or toys. It comes in 3 color options, Merlot, Espresso and Honey so you can match it up with the decor of your room. All components needed to assemble the unit are included. This includes the wooden slats for mattress support, so a box sprint is not required. If you plan to move it around on a wooden or vinyl floor, we recommend fitting floor protectors to the bottom bunk while putting it together. This will allow easy access around all sides when cleaning or changing sheets. It is great for a kids room as well as for a guest room. It comfortably accommodates 4 people, and is excellent value for money for such a high quality piece of furniture. This is any child’s dream bed. By no stretch of the imagination, it converts into a pirate ship or mini-mansion. It is without a doubt a castle of a bed! What makes it unique is its staircase instead of a conventional ladder, and that’s not all… the space under the stairs has been transformed into additional storage space in the form of 4 convenient drawers. It even has a small bookshelf tucked away on the lower level. 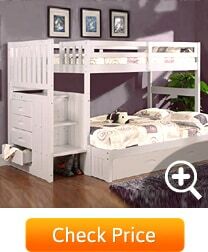 For regular use by kids sharing the bed, the steps are also a slightly safer option over a ladder. 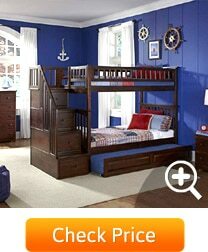 Like our first choice, it has a twin size “up-stairs” section, with a secure railing, over a full sized “down-stairs”. Plus, it has a trundle neatly tucked away in a drawer below. It is a well made unit with wooden support slats that will withstand the demands of both sleepy and excitable children for years to come. The most affordable bunk bed with trundle in our selection is this black metal design by Walker Edison which takes up a minimal 71 x 38 inches of floor space. Its clean, uncomplicated lines deliver exactly what is expected of a bunk bed. The upper level has guard rails and ladder access, it has a twin sized lower level, and a no fuss roll-away truckle that stows away easily on caster wheels. It best suits a room with a minimalist, modern look. With a price that’s hard to beat, this dorm-room style unit comfortably sleeps three on standard twin mattresses. 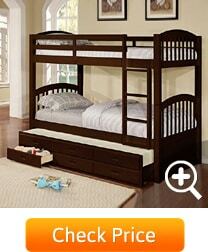 It has sturdy metal support slats on the base, so a box spring is not needed for additional support. The maximum weight capacity of the frame, which has metal base support slats, is 250 pounds so we’d recommend using the bed for children or lighter adults. No bells and whistles, this two tiered frame is simplicity at is best. If you need extra sleeping space on a budget, this piece has you covered. If you love the staircase-with-storage style of bed, we have included another versatile style for you to choose from. It not only comes in 3 color finished, Walnut, Caramel Latte and White, it is also manufactured in 3 different size combinations. They are twin over twin, twin over full and full over full so you can accommodate 3, 4 or 5 happy guests. This beautiful design has 4 drawers built into the steps which turn the dead space into a brilliant toy storage area. This sturdy wooden design is one of the more expensive in our selection, but you get what you pay for, and this piece is built to last. This simple yet elegant ladder bunk takes up a neat 80 x 43 inches of floor space. It is the second most compact in our range while still including a trundle, and 3 neat storage drawers. It comes in 2 colors, Espresso and Honey and is an ideal choice if you are looking for a sturdy, yet compact piece for a kid’s room. If you have a small room and want to maximize the floor area for kids to play, this is a great space saving design that is ‘sleepover’ and ‘storage’ ready. The black metal frame and the last on our list, the Espresso bunk, take up the least floor space of all the style we reviewed. The ladder access to the top does not take up extra space as it does with the staircase styles. Both are traditional, old school bunks at their best. Although the metal style comes in higher on the list for its unbeatable affordability, the Espresso would be our pick between the two. Despite paying more, the finish is excellent, plus, it has the 3 storage drawers that help maximize the use of the space you have available. We vote the wooden white and Columbia staircase design the safest and more user friendly products on our list. This is however relative to the age of the children using the bed, but even a sleepy teenager has to gather his coordination to dismount from the upper level in the middle of the night. 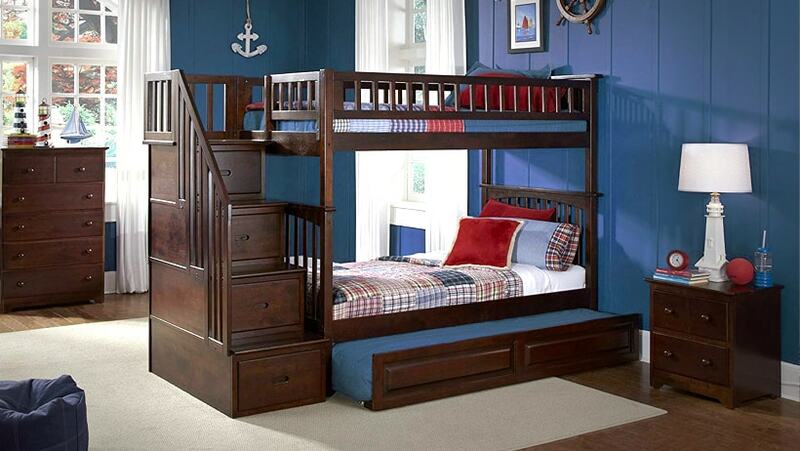 For kids age 4 and up, the staircase design has more appeal than a standard bunk. From a kid’s viewpoint, it’s the ultimate fortress… that you can sleep in, and there’s an extra spot for an extra guest. For how active kids are at this age, we like the idea of easier access to the upper level. 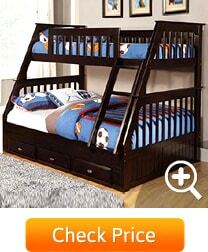 Another benefit if you plan to use this piece of furniture for young kids… storage. With little kids around, there are always more toys than you know what to do with, and the built in drawers take care of that. Again, both of the staircase models make the cut as does number one on our list with its full size lower bunk. 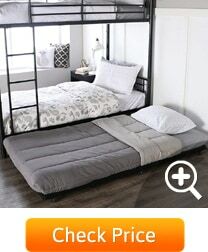 All 3 designs give you the option to sleep 4 people. Having a full sized mattress space on the lower level and a twin at the top also makes sitting on the edge of the bed so much more comfortable and easier to get in and out of. If we had to choose one winner for the title of “most spacious” then the Columbia Staircase bunk is the champion for its size variety. It comes in twin over twin, twin over full and full over full. Depending on your needs, you can comfortably sleep 3, 4 or 5 children or guests… or a combination of the two. The beauty of any trundle bed is that its very design is multi-functional. It saves space, it creates more sleeping room and the trundle can be used for a mattress or for storage. All these pieces outperform your conventional box spring beds by light years, but, if forced to choose the best performer in this category, then the staircase bunks win again. Although they take up a bit more floor space, they are that much more user friendly and they have separate storage space cleverly worked into the stairs. Compact Trundle Bunks open up floor space, so small rooms feel less cramped while accommodating more mattresses. A bunk is not just for kids, it’s also perfect for a guest room, especially if you pick a full size for the lower level. For children who share a room, extra floor space means a larger play area. Size options. Some are available in twin and full sizes, or a combination of both. A compact sleeping area makes space for additional furniture like dressers or decks. Make your budget stretch. Eliminate the need for box springs or headboards. One piece of furniture and affordable foam mattresses are all you need to comfortably sleep three or more. One word, versatility. A bunk with a roll out trundle is highly functional, you’ve gotta love a built-in drawer for extra storage. It accommodates both a growing family and extra holiday guests. Win, win!